Here at AYLIEN, we host a fully-functional research lab of five NLP scientists who carry out leading-edge research into NLP, machine learning, and deep learning. One of the missions of this lab is to constantly feed research output into the models that power our services, so our engineers can build and maintain a world-leading NLP service. Specifically, the benefits of housing a research lab are twofold – not only are our endpoints being constantly updated with state-of-the-art models, but we can also build brand new service offerings based on the latest research. We’re really excited to share the results of some of the work our research and engineering teams have done over the past couple of months. We’ve launched a brand new feature – Entity-level Sentiment Analysis – and made major upgrades to two of our most-used features – Entity and Concept extraction. Using sentiment analysis, people can build software that understands whether a piece of text is positive, negative, or neutral. Usually, the sentiment of a piece of text is analyzed at document-level, meaning, if you analyze a news article or a review, all of the text in that document is analyzed together, and the entire document is classified as having one sentiment. But news articles, product reviews, and even Tweets frequently contain differing sentiment about different things. Which means relying on an overall sentiment score can sometimes be misleading. For example, is the sentence “Steve Jobs is a legend. I guess Apple are ok, but I’d never buy Samsung, those things are too hard to use” positive, negative, or neutral? ELSA has identified each entity mentioned in the sentence and then provided a sentiment score towards that entity. Since the endpoint leverages our Concept Extraction model, which we’ll talk about further down, an entity type is also returned in it’s prediction. ELSA provides much more granular sentiment analysis results and helps supercharge your media monitoring solution by providing accurate and relevant sentiment scores for the brands, products, people and organizations you care about. We’re working on a more detailed walkthrough of ELSA, which we’ll post in the next couple of days, but if you want to dive in and test it out, sign up to the Text Analysis API to start making 1,000 calls to the Text API per day with no charge. The Entity and Concept extraction endpoints are used by our customers to understand what topics and things are being talked about in a piece of text. Each of these endpoints work by recognizing entities such as things, places or people in a piece of text, and the Concepts endpoint goes one further by cross referencing the entities found with DBpedia, and returns the Concepts listed on DBpedia to the user along with their URIs. Both of these endpoints now have new models running under the hood, so the Text Analysis API will now not only recognize more entities in text with the Entities endpoint, but it will also map them even more accurately to DBpedia with the Concepts endpoint. IPTC Subject Codes is one of the major taxonomies used to organize content produced by the media. Our new IPTC classifier effectively doubles the Text Analysis API’s previous coverage of this taxonomy. For the user, this means that the Text Analysis API can now accurately predict much more granular subjects, so you can retrieve much more detailed results. For instance, take a look at the article below, which used to be categorized as ‘software’ (04003005). You can see that the new model categorizes this story as ‘new product’ (04016030), a more granular label that can help users generate better insights. 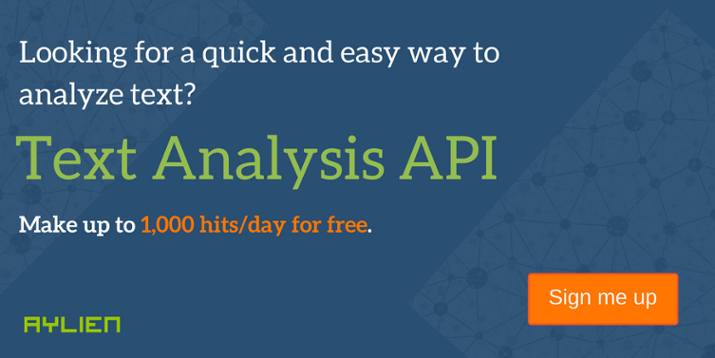 You can try out all of these features for yourself by checking out the Text Analysis API’s demo, but if you want to test it out on data that interests you, sign up and start trying out 1,000 hits per day with no charge.